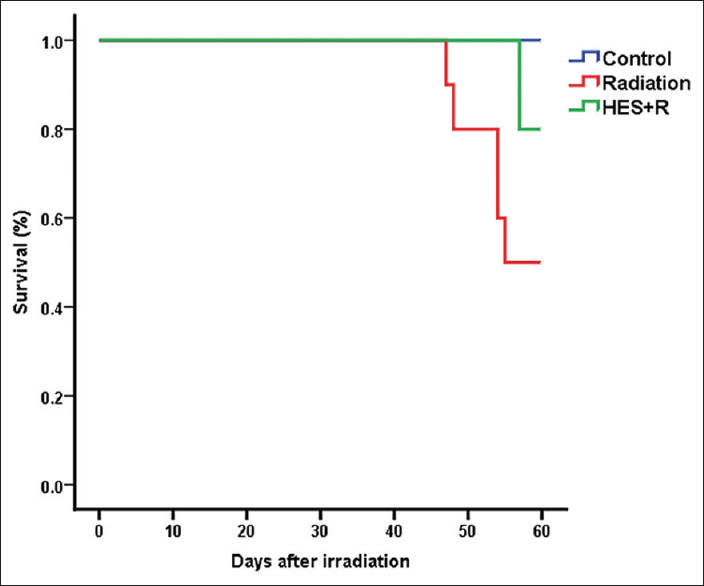 This study was carried out to evaluate radioprotective effects of HES administration before the irradiation on oxidative damages, inflammation and long-term pathological changes of X-radiation in an experimental rat model. All chemicals including HES (CAS registry number: 520-26-3), phosphate buffered saline (PBS) tablet, thiobarbituric acid (TBA), trichloroacetic acid, 1, 1, 3, 3 tetraethoxypropane, ethylenediaminetetraacetic acid (EDTA), ethylene glycol tetraacetic acid (EGTA), 4-(2-hydroxyethyl)-1-piperazineethanesulfonic acid (HEPES) buffer, mannitol, and sucrose were purchased from Sigma Chemical Co. (St. Louis, MO, USA). Healthy adult male Sprague-Dawley rats were purchased from Center of Comparative and Experimental Medicine, Shiraz University of Medical Sciences (SUMS), Shiraz, Iran. Rats weighing 220 ± 5 g were housed in accordance to the principles, outlined in "The Guide for The Care and Use of Laboratory Animals" prepared by SUMS in the university animal house. These principles include characteristics of animal's natural life in captivity situation, using spacious cage, preparing appropriate ventilation and light, handling with care, given standard pellet diet and water ad libitum, etc., All animals were kept under controlled conditions of temperature (23 ± 2°C), humidity (55 ± 5%), and light (12 h of light and dark cycle). Four animals were housed together in polypropylene cages containing sterile husk bedding throughout the experiments. In the end, this study was exactly performed according to the ethical committee instructions of SUMS. HES was dissolved in PBS (pH 7.6) and administered orally using a ball-tipped needle for 7 consecutive days before exposure to irradiation. It should be pointed that the drug was freshly prepared each day. To obtain optimum radiation protective effect of HES, the dose of 100 mg/kg was selected for this study based on the reports by Hosseinimehr et al. and Pradeep et al. , They have shown that as compared to the other doses of HES, this dose has better protective effect against IR-induced damage. To prepare this dose, 22 mg of HES was dissolved in 2 ml of PBS. Male rats were randomly divided into four groups. Group 1 (control): Fourteen rats served as controls only received PBS for 7 days. Group 2 (HES): Eight rats were treated with HES for 7 days. Group 3 (radiation): Eighteen rats received PBS for 7 days and then exposed to X-ray 1 h after the last dose of PBS. Group 4 (HES + R): Eighteen rats were treated with HES for 7 days and then exposed to X-ray 1 h after the last dose of HES. After the last administration of HES or PBS on the 7 th day, the animals in control and HES groups were anesthetized as similar to rats in Radiation and HES + R groups. Eight animals in each group were sacrificed 24 h after RT for biochemical assay and acute histopathological evaluation. Remaining animals were sacrificed 8 weeks after RT for chronic histopathological evaluation. After 24 h of the last dose of the specific treatment, animals were anesthetized with ketamine and xylazine, and then a laparotomy was performed, thus the chest was opened. The heart was perfused in situ through the right ventricle of the heart with sodium chloride 0.9% and diced with scissors. The perfused tissue was cleared from any red blood cells and clot with PBS, at pH 7.4. Furthermore, to determine the SOD activity, 0.3 g of the heart tissue was homogenized in 1.5 ml of cold 20 mM HEPES buffer, pH 7.2, (containing 1 mM EGTA, 210 mM mannitol, and 70 mM sucrose). The crude homogenate was centrifuged 1500 ×g for 5 min at 4°C. Moreover, with determining the total MDA concentrations, 0.2 g of the heart tissue was homogenized in 1 ml of cold buffer (50 mM PBS, pH 7, containing 1 mM EDTA). The crude homogenate was centrifuged 1500 ×g for 10 min at 4°C. Homogenate was prepared using an IKA T 10 basic ULTRA-TURRAX (Germany) homogenizer. And then, the clear supernatant was used for biochemical analysis. SOD activity was assayed using commercial assay kits (Cayman, USA) as per the manufacturer's instructions. The SOD activity was measured using a tetrazolium salt to detect the O 2 °− s generated by xanthine oxidase and hypoxanthine which produced a yellow color that was consequently measured by absorbance at 440 nm. The MDA levels were assayed for products of lipid peroxidation according to TBARS method. MDA content in samples and standards reacted with TBA at 95°C for 20 min, incubated at 25°C for 5 min, and then centrifuged with torque of 5000 rpm at 4°C for 15 min. MDA concentration was spectrophotometrically read at 532 nm and determined in comparison with predetermined MDA standard curve. The SOD activity and MDA concentration are expressed in U/ml and nM, respectively. Rats were anesthetized with ketamine and xylazine. After removal of the heart from the chest, heart were fixed, inflated with 10% neutral buffered formalin introduced through the airways, and then embedded in paraffin. Whole-mount sections of the heart were cut (5 μm), processed, and stained with H and E (H and E), Masson's trichrome (MTC), and Ziehl-Neelsen acid fast (AF). All histopathological studies were performed at the unit of pathology, Faghihee Teaching Hospital, Shiraz, Iran. 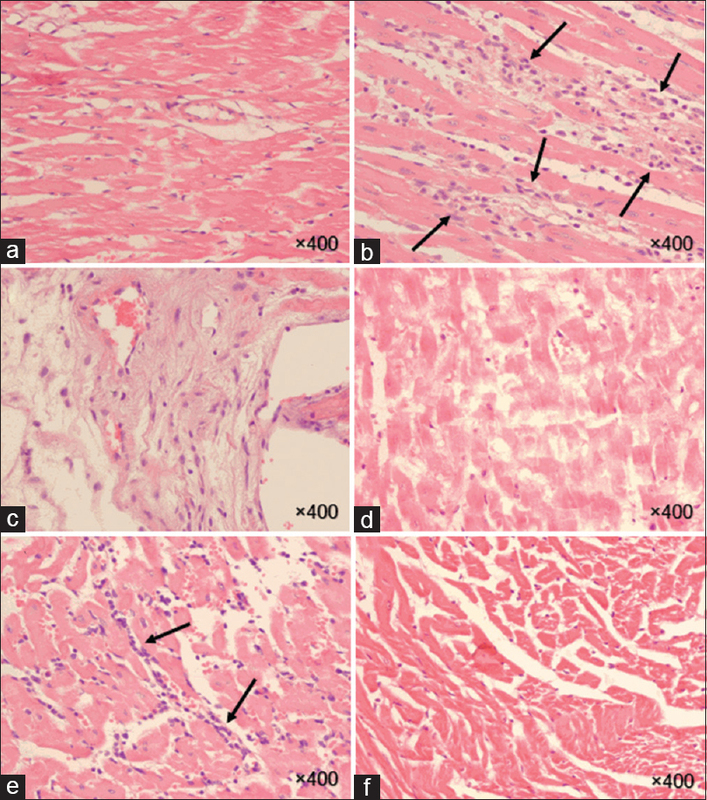 The blinded histopathological evaluation was performed under the light microscope (Olympus BX41TF, Japan) using a semiquantitative scoring system for the severity and extent of histological parameters, in which left and right ventricles were separately examined according to the three layers of the heart (endocardium, myocardium, and epicardium). Inflammation, fibrosis, mast cells, macrophages, myocyte necrosis, plaque, thrombus, myocardial degeneration, vascular damage, and vascular leakage were also the items used for the description of heart radiation injury. The degree of fibrosis and mast cells for each layer of the ventricles was scaled from G0 to G3: G0 indicates no injury, G1 - mild, G2 - moderate, and G3 - severe. Myocyte necrosis was graded as (GX0) no necrosis, (GX1) single cell necrosis, and (GX2) more than one cell. In addition, the description of myocardial inflammation, macrophages, thrombus, plaque, myocardial degeneration, vascular damage, and vascular leakage was quantified by a graded scale from G0 to G3: 0 (no change), 1 (mild), 2 (moderate), and 3 (severe). Sections were stained using H and E for general tissue characterization. 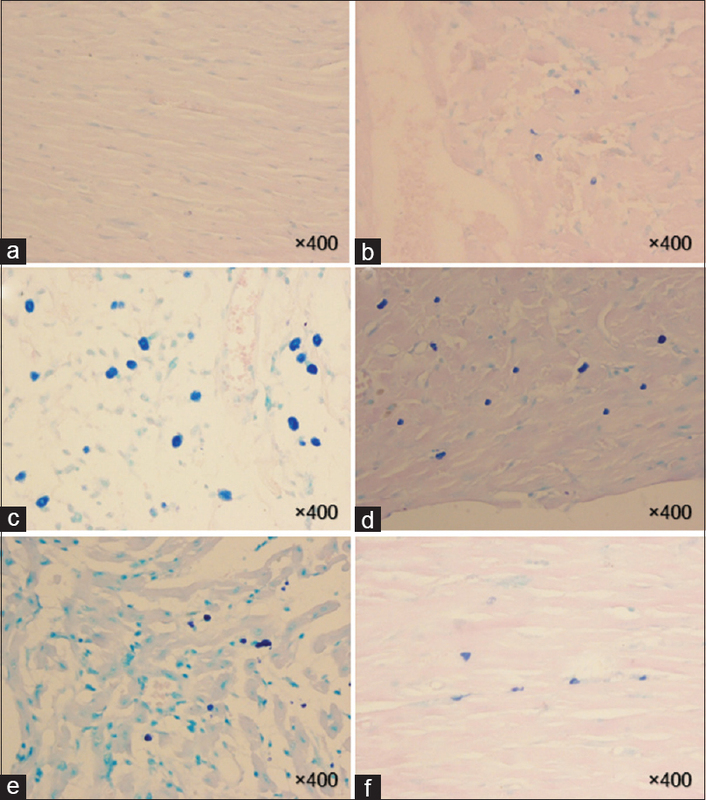 Moreover, total collagen accumulation was determined by preparing tissue sections with MTC stain. , Mast cells were evaluated using AF stain. , The heart index was calculated as follows: Heart index = (heart weight/body weight) ×100. First and foremost, data were analyzed using a commercially available statistics software package (SPSS® for Windows version 19, Chicago, USA). Biochemical assay was analyzed by ANOVA test and post hoc Tukey honest significant difference (HSD). Besides, histopathological evaluations were analyzed by the Pearson Chi-square test and a pair-wise comparison with the Mann-Whitney. A Pearson correlation was run to determine the relationship between left and right ventricles using the bivariate correlation (Pearson) test. A one-way ANOVA test with post hoc Tukey HSD was also performed for evaluating the body weight, heart weight, and heart index. Meanwhile, survival rate was evaluated with Kaplan-Meier method. In this study, the results are presented as mean ± standard deviation; P < 0.05 was considered statistically significant difference. The results of the survival rate, body weights, heart weights, and heart indexes of control and experimental rats evaluated 8 weeks after local-thorax irradiation are shown in [Figure 1] and [Table 1]. Rats were preadministered with 100 mg/kg/day of HES for 7 consecutive days before irradiation and monitored daily for 60 days. The results indicated that the rats, received 18 Gy radiation, showed the signs of discomfort which are characterized by the decreased physical activity and the reduced uptake of food and water. The radiation group also exhibited some signs of radiation sickness such as irritability, ruffling of hair, weight loss, emaciation, and epilation with a median survival period of 55 days. On the other hand, the rats that were preadministered with HES reduced the signs of radiation sickness and significantly improved the physical activity, body weight, and survival rate. The effect of X-rays with or without HES on SOD activity and concentration of MDA in heart tissue for 24 h after irradiation are shown in [Table 2]. The activity of SOD in the heart tissue significantly decreased at 24 h following the irradiation as compared to control group (P < 0.001). Treatment with HES for 7 consecutive days before exposure to X-rays significantly increased the level of HES + R group to near normal, compared to radiation group (P = 0.019). MDA levels in radiation group of heart tissue showed a significant increase (P = 0.002) as compared to control group. HES-treated rats showed significantly decreased levels of MDA (P = 0.023) in HES + R group as compared to radiation group. In addition, the result analyses did not display significant difference among control, HES, and HES + R groups in the SOD and MDA levels. The histopathological observation of the heart sections of the control, HES, radiation, and HES + R groups at 24 h postirradiation was evaluated. The descriptive factors were examined including the presence of macrophages, incidence of myocardial inflammation, myocyte necrosis, plaque, myocardial degeneration, vascular damage, and vascular leakage. According to the results, minimal myocardial inflammation was observed in the radiation and HES + R groups. However, there was no significant difference (P > 0.05) among the 24 h groups [Figure 2]. To determine chronic changes in heart tissue after RT, histopathological evaluations of the heart sections were performed in the control, radiation, and HES + R groups at 8 weeks after radiation [Table 3] and [Figure 3] [Figure 4] [Figure 5]. The descriptive factors examined were the presence of macrophages, incidence of myocardial inflammation, degree of fibrosis and mast cells for each layer, myocyte necrosis, plaque, thrombus, myocardial degeneration, vascular damage, and vascular leakage. The statistical results of the left ventricles were found to be as follows: Inflammation at the myocardial layer reached a significant difference between groups (P = 0.005). According to the results by a pair-wise comparison test, inflammation increased significantly in the radiation group when compared to control (P = 0.001) and inflammation decreased significantly in the HES + R group when compared to radiation group (P = 0.02). Furthermore, histopathological observations of the right ventricles were similar to the left ventricle with significant difference between groups (P = 0.004). Besides, the statistical results were analyzed between radiation and control groups (P = 0.001) and between HES + R and radiation groups (P = 0.02). Observationally, the accumulation of macrophages in all groups was akin to inflammation results as well as statistical results [Figure 4]. Distinctly, there was a strong, positive correlation between inflammation in the left and right ventricle of radiation and HES + R groups, which was statistically significant [Table 4]. (P < 0.001, P < 0.001, and P = 0.001) in the three layers of left ventricle. Myocardial and epicardial fibrosis were significantly abated in the HES + R group when compared to the radiation group. In the right ventricles, observations were similar to the left ventricle with significant difference between groups in the endocardial, myocardial, and epicardial layers (P = 0.005, P < 0.001, and P = 0.002, respectively). As similar to left ventricle, myocardial and epicardial fibrosis were decreased in the HES + R group (P < 0.001 and P = 0.024) in comparison with radiation group. Furthermore, a significant difference between radiation and control groups was perceived in the three layers (P < 0.05). However, in the HES + R groups of both ventricles, endocardial fibrosis was not considered significant when compared to radiation group (P > 0.05). The left myocardial fibrosis revealed a significant correlation with right myocardial fibrosis in the radiation and HES + R groups, separately. A similar correlation was also found to be present between epicardial fibrosis in the left and right ventricles of HES + R group [Table 4]. According to the results, a significant difference among groups (P < 0.05) was observed in the myocardial mast cells in the left ventricles. Endocardial and epicardial mast cells were not found to be significant (P > 0.05). Myocardial mast cell infiltration was likely to be the highest in radiation group (P = 0.002 when compared to control) and the lowest in HES + R group (P = 0.001 when compared to radiation group). Endocardial and epicardial mast cell infiltrations significantly increased in the radiation group in comparison with controls, but not significantly decreased in the HES + R group. The statistical results of the right ventricles expressed a significant difference between groups in the endocardial, myocardial, and epicardial layers (P = 0.021, P = 0.001, and P = 0.023, respectively). Moreover, a significant difference was present between radiation and control groups (P = 0.001) in the three layers of right ventricle. Myocardial mast cells were significantly diminished in the HES + R group when compared to the radiation group (P = 0.001). However, endocardial and epicardial mast cells apparently decreased in the HES + R group with P > 0.05 when compared to the radiation group [Figure 5]. Correlations between the parameters are shown in [Table 4]. As the results indicate, necrosis appeared in the radiation and HES + R groups of left ventricles. In addition, it was unlikely to trace any necrosis in the right ventricles of heart tissues of rats [Figure 4]d. The number and severity of necrosis were observed to be high in radiation group in comparison with control group (P = 0.001). Myocyte necrosis reduced in the HES + R group with a significant difference when compared to radiation group (P = 0.003). On the other hand, myocardium degeneration was enhanced in the left and right ventricles in the radiation group when compared to controls (P = 0.001 and P = 0.002), and reduced in the HES + R group in comparison with radiation group, but no significant difference distinguished (P = 0.154 and P = 0.064). A correlation was obtained between the left and right myocardial degeneration in the radiation groups [Table 4]. Through group analyses, the plaque deposits were significant in the left and right ventricles (P < 0.001 and P = 0.007). In the left, plaque was the highest in the radiation group (P = 0.003 compared to control) and the lowest in the HES + R group (P = 0.009 compared to radiation) [Figure 4]c. In the right, there was a significant difference between the radiation and control groups (P = 0.047). The plaque deposits were the highest in the HES + R group contrary to the radiation group. Hence, there was no significant difference (P = 0.552). Mild thrombus was observed in the left and right ventricle of radiation and HES + R groups. However, no significant difference was recognized in the rats of HES + R and radiation groups (P > 0.05). Besides, there was a positive correlation between the left and right thrombus in the radiation group [Table 4]. As the results indicated, vascular leakage was distinct in the radiation and HES + R groups. On observation, mild vascular leakage was seen in the left and right ventricles of both groups [Table 3]. Statistically significant results were observed between groups in the left ventricle (P = 0.004). There was no significant difference between HES + R and radiation groups (P > 0.05) although a significant difference existed in both right and left ventricles of the radiation group in comparison with control group (P < 0.05). Unexpectedly, no vascular damage was observed in the ventricles of the rats in any groups. The effects of IR are mediated through direct interaction to DNA damage and the production of ROS and reactive nitrogen species in cells as a result of water radiolysis and also the reduction of endogenous scavengers such as SOD and GSH. SOD acts as an initial barrier to oxidant products and catalyzes the dismutation of the O 2 °− into O 2 or H 2 O 2 . Superoxide anions have a pro-inflammatory role in many diseases. As mentioned above, oxidative damages and subsequent immune responses are counted crucial in heart damage and long-term histopathological changes followed by exposure to radiation. In this study, it is hypothesized that preadministration with HES for 7 consecutive days before exposure to a single dose of 18 Gy radiation may ameliorate oxidative damage, inflammatory responses, and long-term pathological changes after exposure to radiation. The irradiation of the chest area of the rats with 18 Gy results in oxidative damage and pathological changes in the heart tissue. The early oxidative damage is associated with the increased MDA level and decreased SOD enzyme activity. Long-term changes are also associated with the decreased survival, body and heart weight, and increased heart tissue index. Besides, the irradiation of heart tissue results in inflammation in both right and left ventricles. Fibrosis and the increased number of mast cells were observed in both right and left ventricles of epicardium, myocardium, and endocardium. The increased number of macrophages, plaque, vascular leakage, and myocardial degeneration are obvious in both right and left ventricles. Moreover, myocyte necrosis is conspicuous in the left ventricles but not in the right ventricles. The administration of HES decreases inflammation for both right and left ventricles. 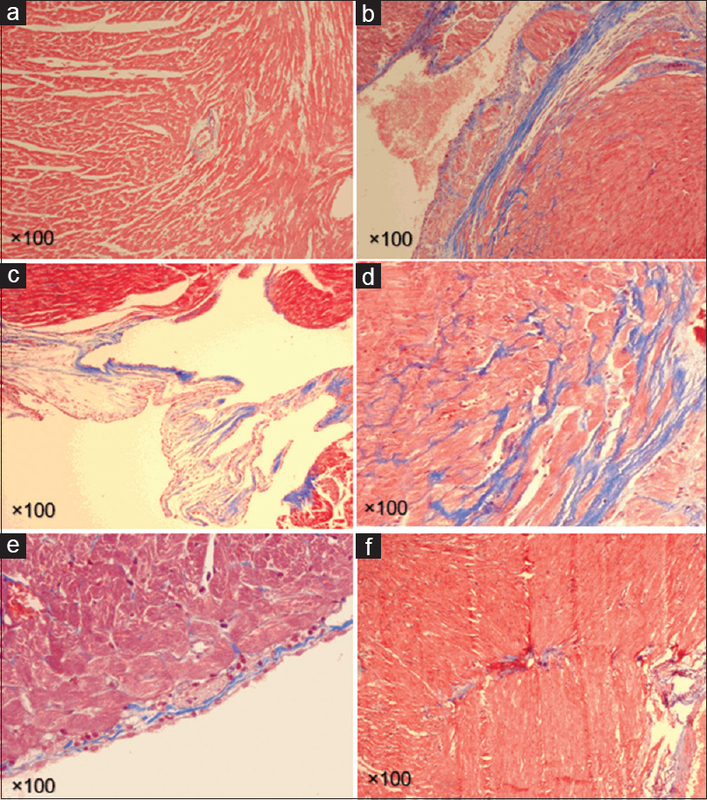 Fibrosis decreases in left and right ventricles of epicardium and myocardium but not in endocardium. However, mast cell numbers decrease only in left and right myocardial. The administration of HES decreases macrophage number in both left and right ventricles. The increased myocyte necrosis in left ventricle is ameliorated with HES preadministration. Plaque deposition is reduced only for left ventricle. Furthermore, HES could not ameliorate thrombus, myocardium degeneration, and vascular leakage in both left and right ventricles. According to the results, preadministration of HES is enabled to ameliorate oxidative damages, inflammation and subsequent cell death after RT, which can cause the increased risk of heart diseases during years after radiation treatment. HES known as an antioxidant and anti-inflammatory drug may help alleviate short- and long-term side effects on patients who have undergone radiation for cancer treatment. In the end, more studies will be needed to understand the effects of HES administration on immune response signaling, different inflammation pathways, and DNA repair mechanisms. The authors greatly would like to thank Vice-Chancellor of Research of Fasa University of Medical Sciences for authorizing and funding this study. This study was financially supported by the grant number 94012 from the Vice-Chancellor of Research of Fasa University of Medical Sciences. Adams MJ, Hardenbergh PH, Constine LS, Lipshultz SE. Radiation-associated cardiovascular disease. Crit Rev Oncol Hematol 2003;45:55-75. Madan R, Benson R, Sharma DN, Julka PK, Rath GK. Radiation induced heart disease: Pathogenesis, management and review literature. J Egypt Natl Canc Inst 2015;27:187-93. Heidenreich PA, Schnittger I, Strauss HW, Vagelos RH, Lee BK, Mariscal CS, et al. Screening for coronary artery disease after mediastinal irradiation for Hodgkin's disease. J Clin Oncol 2007;25:43-9. Carver JR, Shapiro CL, Ng A, Jacobs L, Schwartz C, Virgo KS, et al. American Society of Clinical Oncology clinical evidence review on the ongoing care of adult cancer survivors: Cardiac and pulmonary late effects. J Clin Oncol 2007;25:3991-4008. Shimizu Y, Pierce DA, Preston DL, Mabuchi K. Studies of the mortality of atomic bomb survivors. Report 12, part II. Noncancer mortality: 1950-1990. Radiat Res 1999;152:374-89. Shimizu Y, Kodama K, Nishi N, Kasagi F, Suyama A, Soda M, et al. Radiation exposure and circulatory disease risk: Hiroshima and Nagasaki atomic bomb survivor data, 1950-2003. BMJ 2010;340:b5349. Marmot MG, Syme SL, Kagan A, Kato H, Cohen JB, Belsky J. Epidemiologic studies of coronary heart disease and stroke in Japanese men living in Japan, Hawaii and California: Prevalence of coronary and hypertensive heart disease and associated risk factors. Am J Epidemiol 1975;102:514-25. Yusuf SW, Sami S, Daher IN. Radiation-induced heart disease: A clinical update. Cardiol Res Pract 2011;2011:317659. Boerma M, Hauer-Jensen M. Preclinical research into basic mechanisms of radiation-induced heart disease. Cardiol Res Pract 2010;2011. pii: 858262. Kaya H, Delibas N, Serteser M, Ulukaya E, Ozkaya O. The effect of melatonin on lipid peroxidation during radiotherapy in female rats. Strahlenther Onkol 1999;175:285-8. Taysi S, Uslu C, Akcay F, Sutbeyaz MY. Malondialdehyde and nitric oxide levels in the plasma of patients with advanced laryngeal cancer. Surg Today 2003;33:651-4. Noaman E, Zahran AM, Kamal AM, Omran MF. Vitamin E and selenium administration as a modulator of antioxidant defense system: Biochemical assessment and modification. Biol Trace Elem Res 2002;86:55-64. Maritim AC, Sanders RA, Watkins JB 3 rd . Diabetes, oxidative stress, and antioxidants: A review. J Biochem Mol Toxicol 2003;17:24-38. Sun J, Chen Y, Li M, Ge Z. Role of antioxidant enzymes on ionizing radiation resistance. Free Radic Biol Med 1998;24:586-93. Polat MF, Taysi S, Gul M, Cikman O, Yilmaz I, Bakan E, et al. Oxidant/antioxidant status in blood of patients with malignant breast tumour and benign breast disease. Cell Biochem Funct 2002;20:327-31. Wilmsen PK, Spada DS, Salvador M. Antioxidant activity of the flavonoid hesperidin in chemical and biological systems. J Agric Food Chem 2005;53:4757-61. Parhiz H, Roohbakhsh A, Soltani F, Rezaee R, Iranshahi M. Antioxidant and anti-inflammatory properties of the citrus flavonoids hesperidin and hesperetin: An updated review of their molecular mechanisms and experimental models. Phytother Res 2015;29:323-31. Kuntic V, Brboric J, Holclajtner-Antunovic I, Uskokovic-Markovic S. Evaluating the bioactive effects of flavonoid hesperidin - A new literature data survey. Vojnosanit Pregl 2014;71:60-5. Lauk S, Kiszel Z, Buschmann J, Trott KR. Radiation-induced heart disease in rats. Int J Radiat Oncol Biol Phys 1985;11:801-8. Gürses I, Özeren M, Serin M, Yücel N, Erkal HS. Histopathological evaluation of melatonin as a protective agent in heart injury induced by radiation in a rat model. Pathol Res Pract 2014;210:863-71. Gamble M. The hematoxyline and eosin. In: Bancroft JD, Gamble M, editors. Theory and Practice of Histological Techniques. 6 th ed. Philadelphia: Churchill Livingstone/Elsevier; 2008. p. 121-34. Sheehan D, Hrapchak B. Theory and Practice of Histotechnology. 2 nd ed. Ohio: Battelle Press; 1980. p. 189-90. Jones ML, Bancroft JD, Gamble M. Connective tissues and stains. In: Bancroft JD, Gamble M, editors. Theory and Practice of Histological Techniques. 6 th ed. Philadelphia: Churchill Livingstone/Elsevier; 2008. p. 135-60. Eagle RC. Eye Pathology: An Atlas and Text. 2 nd ed. Philadelphia, London: Lippincott Williams and Wilkins; 2010. p. 28. Loew JM, Macon WR. Lymph nodes. In: Gattuso P, Reddy VB, David O, Spitz DJ, Haber MH, editors. Differential Diagnosis in Surgical Pathology. 2 nd ed. Philadelphia: W.B. Saunders; 2010. p. 761. Li C, Zhou HM. The role of manganese superoxide dismutase in inflammation defense. Enzyme Res 2011;2011:387176. Kruidenier L, Kuiper I, Lamers CB, Verspaget HW. Intestinal oxidative damage in inflammatory bowel disease: Semi-quantification, localization, and association with mucosal antioxidants. J Pathol 2003;201:28-36. Azzam EI, Jay-Gerin JP, Pain D. Ionizing radiation-induced metabolic oxidative stress and prolonged cell injury. Cancer Lett 2012;327:48-60. Zhao W, Robbins ME. Inflammation and chronic oxidative stress in radiation-induced late normal tissue injury: Therapeutic implications. Curr Med Chem 2009;16:130-43. Stewart FA, Heeneman S, Te Poele J, Kruse J, Russell NS, Gijbels M, et al. Ionizing radiation accelerates the development of atherosclerotic lesions in ApoE-/- mice and predisposes to an inflammatory plaque phenotype prone to hemorrhage. Am J Pathol 2006;168:649-58. Theoharides TC, Kempuraj D, Tagen M, Conti P, Kalogeromitros D. Differential release of mast cell mediators and the pathogenesis of inflammation. Immunol Rev 2007;217:65-78. Levick SP, Meléndez GC, Plante E, McLarty JL, Brower GL, Janicki JS. 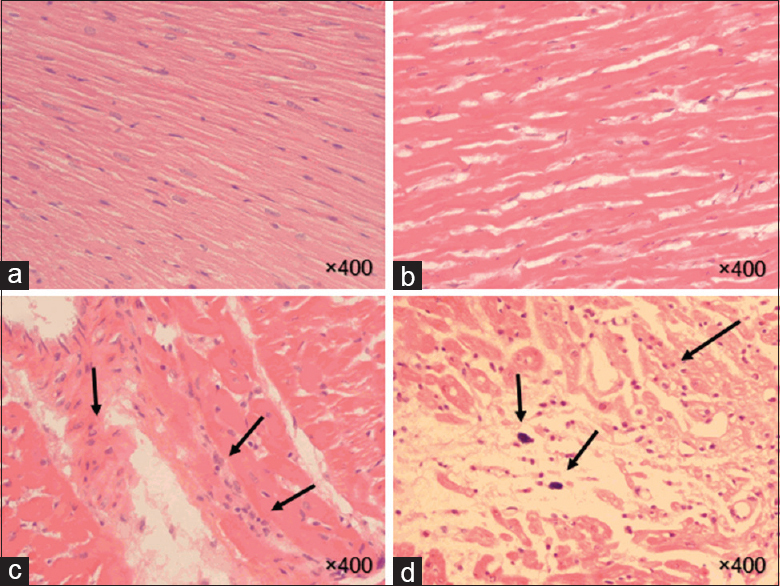 Cardiac mast cells: The centrepiece in adverse myocardial remodelling. Cardiovasc Res 2011;89:12-9. Palaniyandi Selvaraj S, Watanabe K, Ma M, Tachikawa H, Kodama M, Aizawa Y. Involvement of mast cells in the development of fibrosis in rats with postmyocarditis dilated cardiomyopathy. Biol Pharm Bull 2005;28:2128-32. Frey N, Katus HA, Olson EN, Hill JA. Hypertrophy of the heart: A new therapeutic target? Circulation 2004;109:1580-9. Yeh ET, Tong AT, Lenihan DJ, Yusuf SW, Swafford J, Champion C, et al. Cardiovascular complications of cancer therapy: Diagnosis, pathogenesis, and management. Circulation 2004;109:3122-31. Weintraub NL, Jones WK, Manka D. Understanding radiation-induced vascular disease. J Am Coll Cardiol 2010;55:1237-9. Carlson RG, Mayfield WR, Normann S, Alexander JA. Radiation-associated valvular disease. Chest 1991;99:538-45. Shapiro CL, Hardenbergh PH, Gelman R, Blanks D, Hauptman P, Recht A, et al. Cardiac effects of adjuvant doxorubicin and radiation therapy in breast cancer patients. J Clin Oncol 1998;16:3493-501. Pradeep K, Ko KC, Choi MH, Kang JA, Chung YJ, Park SH. Protective effect of hesperidin, a citrus flavanoglycone, against gamma-radiation-induced tissue damage in Sprague-Dawley rats. J Med Food 2012;15:419-27. Ahmed HM, Hussein MA, Alazonee AS. Radioprotective effect of hesperidin against gamma-irradiation-induced oxidative stress and biomechanical properties of bone in rats. Life Sci J 2013;10:2857-65. Park S, Pradeep K, Ko KC. Protective effect of hesperidin against g-radiation induced oxidative stress in Sprague-Dawley rats. Pharm Biol 2009;47:940-7.